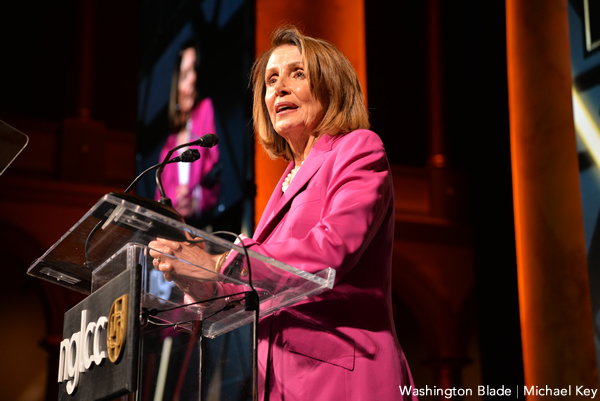 House Minority Leader Nancy Pelosi (D-Calif.) on Friday celebrated Democrats regaining control of the U.S. House of Representatives when she made a surprise appearance at the National LGBT Chamber of Commerce’s National Dinner Gala. “The American people elected a Democratic majority,” said Pelosi to applause as she spoke at the National Building Museum in D.C.
Pelosi spoke hours after Justin Nelson and Chance Mitchell — co-founders of NGLCC — and more than 100 other leading LGBT activists “enthusiastically” endorsed her for speaker. “We must finally give sexual orientation and gender identity the full civil rights protection they deserve,” said Pelosi. Pelosi in her remarks noted 2019 will mark 50 years since the Stonewall riots. 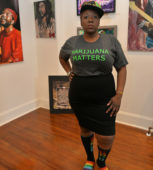 She noted sexual orientation and gender identity have been added to the federal hate crimes law and “Don’t Ask, Don’t Tell” and the Defense of Marriage Act have been repealed over the last decade. Pelosi also criticized President Trump for reinstituting a ban on transgender people in the military. Dennis and Judy Shepard, whose gay son, Matthew Shepard, was killed in Wyoming in 1998, were among the hundreds of people who attended the dinner. National Center for Transgender Equality Executive Director Mara Keisling, Costa Rican Ambassador to the U.S. Fernando Llorca, Swedish Ambassador to the U.S. Karin Olofsdotter, Simran Shaikh of the India HIV/AIDS Alliance and Andrés Alberto Vásquez Moreno of the Colombia LGBT Chamber of Commerce were also in attendance.